Sensation from the viscera; which is usually the abdominal area: Manfred had a sudden feeling of splanchnesthesia and so he rushed to the washroom before he might have to regurgitate. The sense of balance controlled by the "vestibular organ" in the internal ear: Orwell’s normal stataesthesia was disrupted when he developed an ear infection and started to lose his balance. Reduced tactile ability to identify the form, size, weight, and texture of objects: When she is blindfolded, Roberta’s stereoanesthesia is increased because she needs her sense of vision in order to increase her awareness as to what she is touching. A painful sensation giving rise to a subjective one of a different feeling: Upon smelling fried onions, Fred experienced synaesthesialgia again as he felt pain in his left hand which he burned when he was a short order cook. 1. Referring to a condition in which one type of stimulation evokes the sensation of another, as when the hearing of a sound produces the visualization of a color: Hearing the sounds of crashing waves was always a synaesthetic experience for Rodrigo because they reminded him of the times when he was a teenager surfing so often on the coast of Florida. 2. Relating to a sensation felt in one part of the body as a result of stimulus applied to another part, as with referred pain: When Dr. Thomas tapped Tomas’ left knee, his right leg jerked in a synaesthetic response. 1. A condition in which one type of stimulation evokes the sensation of another, as when the hearing of a sound produces the visualization of a color: Whenever Sue sees waves crashing against a cliff, she always experiences synesthesia, as if she were hearing bagpipes in the background, reminding her of "The Scottish Fantasy" by Mendelssohn-Bartholdy. 2. A sensation felt in one part of the body as a result of stimulus applied to another area, as in referred pain: Sam noticed that whenever Dr. McMahon stuck a pin in the bottom of one of his feet, the other foot winced in synesthesia as if it were the one that was in pain. 3. The description of one kind of sense impression by using words that normally describe another feeling: The sound of some music can be described in tactile terms of synesthesia; such as, hard, rough, coarse, smooth, etc. 4. A condition in which normally separate senses are not separated: Dr. Tweedie, the psychologist, was puzzled by Jane's description of her synesthesia or her inability to distinguish between the input of her various senses and where they should be normally felt. Sight may mingle with sound, taste with touch, etc. The senses are cross-wired; for example, when a digit-color synesthete sees or just thinks of a number, the number appears with a color film over it. A given number's color never changes; it appears every time with the number. Synesthesia can take many forms. A synesthete may sense the taste of chicken as a pointed object. Other synesthetes sense colors. Still others may have several senses cross-wired. 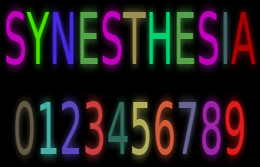 Estimates of the frequency of synesthesia range from 1 in 250,000 to 1 in 2,000. People with synesthesia are six times more likely to be female than male. Most synesthetes find their unusual sensory abilities enjoyable. People with synesthesia often report that one or more of their family members also have synesthesia, so it may, at least in some cases, be an inherited condition. It may be that synesthesia arises when particular senses fail to become fully independent of one another during normal development. According to this school of thought, all babies are synesthetes. Synesthesia can be induced by certain hallucinogenic drugs and can also occur in some types of seizure disorders. The words synesthesia is a hybrid of Latin and Greek and comes from Latin syn-, "together" + -esthesia, from the Greek aisthesis, "sensation" or "perception". The Scientific American; "What is Synesthesia?" by J. Weinstock; June 17, 2002. Daniel Tammet is a high-functioning autistic savant. He can calculate huge sums in his head in seconds and instantaneously recognise prime numbers. One of fewer than fifty such people living worldwide, Daniel is unique in his ability to articulate his savant experience. He describes his visual experience of numbers as complex "synaesthetic shapes" with color, texture, and motion. "Thirty-seven is lumpy like porridge, while eighty-nine reminds him of falling snow. Sequences of digits form visual landscapes in his mind." Compiled from information found in Optimnem:The Official Website of Daniel Tammet. The involuntary feeling of sensation in one part of the body when another part is stimulated: Whenever Michael heard exhilarating marching band music, he experienced synesthesis and could feel his toes tingling. Someone who, when stimulated, experiences a secondary sensation of sound as a color or of certain colors as sounds: Mr. Johnson, identified as a synesthete by his psychologist, Dr. Smith, often experienced loud sounds when he smelled certain strong odors; such as, vinegar. The recognition of intermittency of illumination; flicker perception: Jennifer avoids going to popular clubs which use strobe lighting, because her tachistesthesia tends to trigger nausea. A reduced perception of touch: Mindy was experiencing tactile hypoesthesia or numbness in her feet after the operation on her cracked vertebrae. 1. Perception at a distance; direct sensation or perception of objects or conditions independent of the recognized channels of the senses: Telaesthesia is a New Age concept of the visualization of events without actually seeing them. 2. Extrasensory perception of distant objects, events, etc. : Edwin claimed to possess telaesthesia in that he would appear to go into a trance and describe objects that were not actually visible. 1. Relating to a supposed perception of phenomena or events considered beyond the range of the normal senses: Malcolm’s telesthetic skills were well-known and he was often invited to various séances. 2. A reference to a response to, or perception of, distant stimuli by extrasensory means: Although no one else heard the tolling of a bell, suddenly Marisa exclaimed that her telesthetic sense told her someone had died and she heard the toll of a church bell. 1. Sensitivity to heat: Laura’s extreme thermaesthesia made it necessary for her to stay in the shade whenever possible while she was outside in warm weather. 2. The ability to distinguish differences of temperature: As part of his science experiment, Noland learned to measure thermaesthesia in different animals. 3. A feeling in the body which recognizes heat and cold sensations: When Jason is either sweating or shivering, he is experiencing thermaesthesia. 1. The inability to distinguish between heat and cold: A newborn child is a good example of an individual who experiences thermanesthesia and cannot distinguish between hot and cold. 2. Absence or loss of heat-perception; insensibility to heat: As a result of nerve damage in her hand, Quincy had thermanesthesia and so she had to be very careful when working in the kitchen. An instrument for measuring sensibility to heat: Dr. Rogan pursued his efforts to develop a new thermesthesiometer to use in the farming industry. Showing page 19 out of 21 pages of 306 main-word entries or main-word-entry groups.